When you are deciding which barbecue sauce recipe to use, it is important to know the different varieties of sauces, as they can differ greatly. Cooking up a barbecue sauce takes some time, so you want to know the end result will be compatible with your taste buds. In fact, I was involved in the creation of a line of BBQ and steak sauces, and it was a fascinating experience. I helped come up with a line of rubs too. Let's take a little time and look at the different varieties found in the USA. Each region has it's favorite style, and if you want to engage in a serious BBQ debate, question the quality of a regions barbecue sauce recipe. And if you are a Yankee questioning their sauce, "them are fighten' words!" The earliest version of BBQ sauce is said to be vinegar that the pulled pork was dipped into. As time went on, people started doctoring up the vinegar and adding ingredients that were popular and/or abundant in their area, leading to regional variations. Some regions over time have practically eliminated vinegar as an ingredient. Based on the regional variation you choose to go with, the ending sauce can be vinegary, sweet, spicy, tangy or a combination of one or all of these characteristics. Let's look at the regional characteristics of these sauces. One of these will be the base for your barbecue sauce recipe. North Carolina and Virginia: Primarily vinegar based with sugar and red pepper flakes as well as ground black pepper. The end result is very tart and can have a lot of heat. South Carolina: Many people find this sauce the most unusual, as the primary ingredients are mustard and vinegar. Georgia: A thin sauce of mustard, vinegar and tomato. Smoky Mountains: A thin sauce made of tomato, ketchup, vinegar and sugar. Florida: A tomato based sauce with additions of lime and lemon. See how the ingredients native to a region can influence the sauce? Northern Alabama: Another unique sauce, called "white bbq sauce." 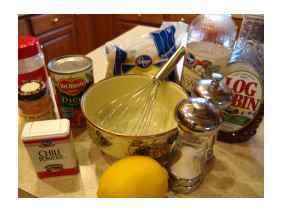 Instead of tomato, mayonnaise is the base, combined with black and cayenne pepper, lemon and vinegar. I have never tried this one but will do it very soon and report back to you! Kentucky: Worcestershire, vinegar and Kentucky bourbon are the primary ingredients in this dark BBQ sauce. Texas: These folks take their BBQ seriously, and beef is their primary meat of choice. Their sauces are tomato based with a Mexican influence of hot peppers. Their sauces can be VERY spicy and not as sweet as other sauces. Midwest and Plains: Originating out of St. Louis, these are thicker tomato based sauces but heavier on the sweetness and spice. Soda Sauces: This isn't a real category in BBQ circles, but I am going to make it one here on BBQMyWay.com. These are barbecue sauce recipes that include a soda as an ingredient. Click Here to view some great sauce recipes. Leave Barbecue Sauce Recipe and Return to BBQMyWay Homepage.